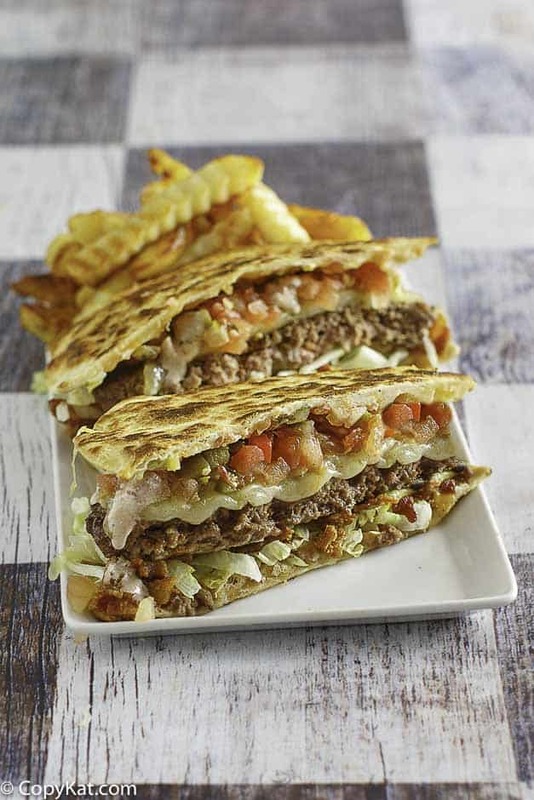 If you have never tried the amazing Applebees Quesadilla Burger you are in for something extraordinary. Part burger, part quesadilla, all 100% delicious. Make this amazing cheeseburger recipe in under 30 minutes! 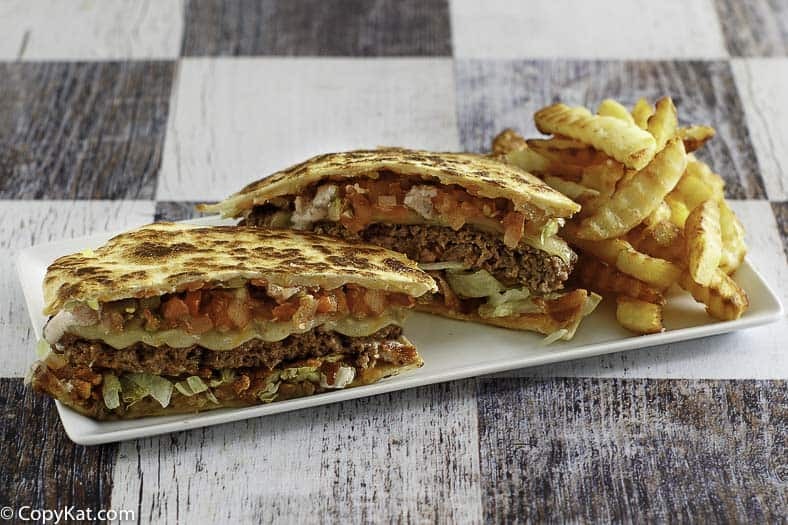 The Applebees Quesadilla Burger has to be one of the best hamburgers you can get in a restaurant. This cheesy burger is designed for those who love Mexican food and hamburgers. 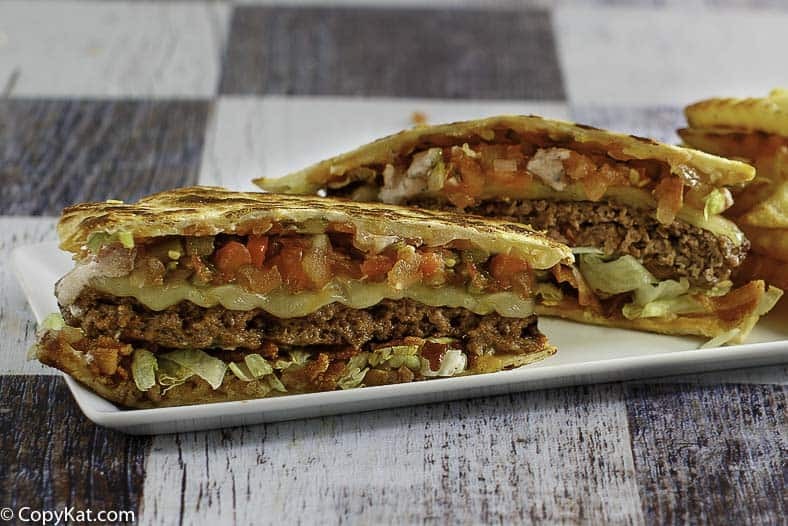 Why have an ordinary hamburger when you can have a quesadilla as your bun? What’s on this Quesadilla burger? This burger is made from a well-seasoned ground chuck beef patties. 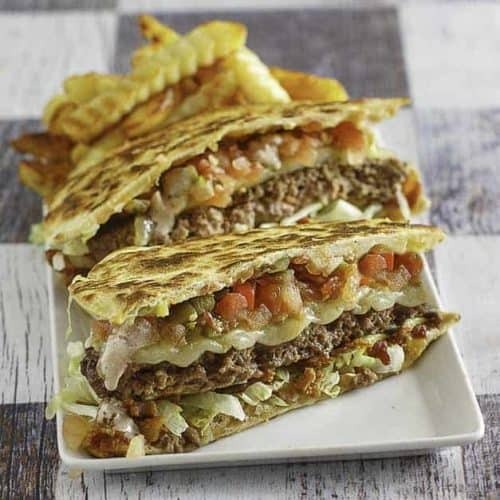 The meat is topped with slices of Pepper Jack cheese, a delicious Mexi-ranch sauce, crispy Applewood smoked bacon, fresh pico de gallo, crispy fresh lettuce, and this burger is surrounded by warm Cheddar cheese quesadillas. What’s the secret to this burger? The secret to this burger is simple ingredients prepared in a unique way. Everyone has made a basic cheeseburger, here we upgrade the cheese, add bacon, and change out the condiments slightly. The real upgrade is the Cheddar cheese quesadilla. In no time at all you and your family can enjoy one amazing burger. What type of ground beef should you use? Ground chuck has just the right amount of marbling to make the burger juicy and not dry. Ground cut is beef that is 80% lean, and 20% fat. Ground beef like sirloin is a bit too dry to carry this burger off. Plain ground hamburger meat can have as much as 30% fat, and that’s too rich for all of the cheese involved in this burger. Love Applebees? Don’t stop with this burger, there is more! Who doesn’t love the Applebees restaurant? Enjoy their French Onion Soup, Applebee’s Grilled Chicken Oriental Salad, and finish with one of their famous Applebees Triple Chocolate Meltdown desserts. In a small bowl combine sour cream, Ranch Salad dressing, Picante sauce, and taco seasoning. Stir to combine. Prepare 8 quesadillas by dividing the cheese into 8 portions. Place equal amounts of cheese on 8 tortillas. Place the remaining 8 tortillas on top of the cheese-covered tortillas. In a large non-stick skillet over medium heat, cook the quesadillas for about two minutes on each side. The quesadillas should be golden brown, and the cheese should be melted. Keep quesadillas in the warm oven while you cook the burgers. In a bowl combine the ground beef, salt, and black pepper. Stir to combine. Divide beef into 4 patties. Wipe out your non-stick skillet with a paper towel, and cook the burgers over medium heat for 4 to 5 minutes on each side. Place one quesadilla down on a plate, add 1 burger patty. Top burger patty with 2 slices of Pepper Jack cheese, and 2 slices of cooked bacon. Top burger with pico de gallo, shredded lettuce, and Mexi-Sauce. Want perfectly cooked bacon? Try baking it in the oven, no mess, and perfectly flat crisp bacon. Make the Mexi-sauce ahead of time, and if you have any left over, it makes a great salad dressing! Have leftover chicken or grilled veggies, add them to the quesadillas! You can purchase prepared pico de gallo or make your own homemade pico de gallo. Can’t tweet the recipe, why???????? I had too many characters in that field. Let me fix that! My wife was a manager at 3 Applebees in another lifetime. This was always one of their top requested items she said. She thought the key to this burger was to have a good crunch on the shells. Now that I brought this up, she will make them this week for us. Bless you Steph! You are awesome. I always love your comments. I just had that burger for the first time recently. It’s a really good burger. So excited to give this a try!